The New Silicon Valley Chic? The new online apparel company Saboteur, led by the guy who did Justin.tv, envisions a new kind of geek fashion. We took a first look. Then, around a year ago, Justin Kan, founder of the live video streaming site justin.tv, overheard an employee remark that the office felt a bit unprofessional. The comment stuck, and Kan’s response was to begin dressing up for work in a shirt and tie. Immediately he felt a difference: Dressing better made him feel better. Around the same time, Kan’s friend Kristen Slowe (wife of Reddit founder Chris Slowe) mentioned to Kan that she was thinking of starting a new clothing line. The two got to wondering: What would a Silicon Valley fashion look like? The result is Saboteur, an apparel company whose website goes live today. Silicon Valley fashion, it turns out, involves a few things. First of all, the blazers are cut especially slim, making them perfect to slip over that T-shirt you’ve become attached to. 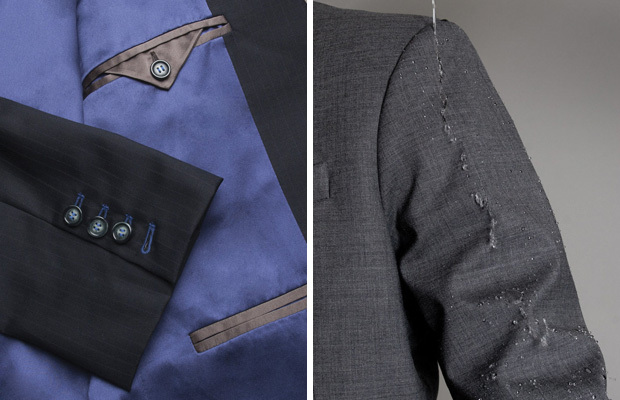 The handful of jackets and shirts that Slowe has designed also feature contrast stitching or lining–bright red buttonhole stitching on an otherwise sober gray coat, for instance–to enable a special brand of geek chic. And of course, there’s an element of gee-whiz futurism involved, as with this waterproof blazer made out of a special treated wool blend from Switzerland. “You can dump a pitcher of water on it and it’ll look fine, it’ll bead the water off,” says Kan.
For Kan, it was a new venture, very different from his work at justin.tv. After his own conversion to fashionable dress, he thought he spied a market opportunity for those like him. He and Slowe decided to sell their clothes exclusively through the Web. “If you go downtown, retail stores are suffering,” he says. “The lower overhead allows us to innovate more, and experiment with what works.” Online, after all, is “a space I know much better,” says Kan. The online venture faces one major hurdle: How will a bunch of style-devoid tech geeks be competent enough to buy the right clothes remotely? Retail stores may be struggling, but at least they have employees to help clueless shoppers buy clothes that fit. “That’s the number one problem,” admits Kan. He envisions a 30-day return policy.